Even as the Nazis campaigned against degenerate jazz music, Joseph Goebbels and his Propaganda Ministry were creating a jazz orchestra that would serve up Nazi propaganda backed by the latest swing music. The dynamics of a society rushing headlong to self-destruction and taking its citizens down with it, plunging all Germans into war at every level. Germany: The Catholic Christian trade unions are dissolved by Hitler's Government. Many Trade Union leaders are arrested and taken to camps and prisons. Spain: Day 343 of 985 of the Spanish Civil War. Spain: Day 708 of 985 of the Spanish Civil War. CBI - China: Day 353 of 2,987 of the 2nd Sino-Japanese War. Day 14 of 139 of the Battle of Wuhan. CBI - China: Day 718 of 2,987 of the 2nd Sino-Japanese War. Day 11 of 68 of the Battle of Tianjin. Day 4 of 7 of Operation SWATOW, the Japanese offensive to take Shantou in southern China. Thailand: The government of Siam changes its name to Thailand, which means "Free Land" (but it won't be free for long). CBI - Mongolia: Day 45 of 129 of the Battle of Khalkhin Gol, a border dispute between the Soviet Union and Japan. Atlantic: German sub U-47 sinks the Panamanian ship CATHRINE about 300 miles west of Land's End in southwestern England. The entire crew of 19 gets into lifeboats and are given food and red wine by the German crew before being left adrift for their eventual rescue. MTO - Italy: An armistice is signed between France and Italy at Villa Indusa near Rome. However, fighting will continue until the following day when the agreement takes effect. East Africa: Day 15 of 537 of Italy's East African campaign in the lands south of Egypt. British sloop HMS FALMOUTH sinks the Italian submarine LUIGI GALVANI in the Gulf of Oman. CBI - China: Day 1,084 of 2,987 of the 2nd Sino-Japanese War. Day 223 of 381 of the Battle of South Guangxi. Japan requests that Britain closes the Burma Road, a by-land supply route into China. This prompts China to protest to Vichy France to see that it remains open. UK: The House of Commons votes for another £1,000 million war credit. War expenditure now exceeds £10,250,000 per day. ETO - Germany: The RAF bombs Düsseldorf. ETO - Spain: Large demonstrations begin in Madrid, Spain, in support of the German invasion of the Soviet Union. Such demonstrations soon spread to other parts of Spain. Soviet Union: In Russia, a Council of Evacuation is set up with emergency powers to oversee the evacuation of machinery, skilled workers and food stuffs on a large scale to keep away from the German advance. Russian Front - Finland: Day 3 of 164 of the Battle of Hanko. Russian Front: Day 3 of 167 of Germany's Operation BARBAROSSA, the invasion of the USSR. Russian Front - North: The German E-Boat S-35 discovers the Soviet submarine S-3 off Steinort, Germany, and sinks her with depth charges and hand grenades. Russian Front - Lithuania: Day 2 of 5 of the Battle of Raseiniai. The Germans seize Vilnius and Kaunas. Russian Front - Center: Day 3 of 12 of the Battle of Minsk. Russian Front - Center: Day 3 of 8 of the Battle of Brest, Russia. Russian Front - South: Day 2 of 8 of the Battle of Brody, Poland. Hungary: Hungary breaks off diplomatic relations with the Soviet Union. MTO - Libya: Day 76 of 256 of the Siege of Tobruk. Middle East: Day 17 of 37 of the Battle for Syria and Lebanon. East Africa: Day 380 of 537 of Italy's East African campaign in the lands south of Egypt. CBI - China: Day 1,449 of 2,987 of the 2nd Sino-Japanese War. CBI - Indochina: Japan asserts pressure on Vichy France for puppet control of Indochina. Atlantic: Day 162 of 169 of Germany's Second "Happy Time," during which U-boats sink 609 Allied ships with little risk. ETO - UK: The Luftwaffe launches the first in a series of night raids on Birmingham. Russian Front - North: Day 290 of 872 of the Siege of Leningrad. Russian Front - North: Day 51 of 658 of the Siege of the Kholm Pocket. Russian Front - Center: Day 27 of 31 of Operation KREMLIN, a German diversion to trick the Soviets into thinking Moscow is their main objective instead of Stalingrad and the Caucasus. Russian Front - South: Day 238 of 248 of the Siege of Sevastopol, Crimean Peninsula. The Germans keep pushing on the Soviet's east line. MTO - Yugoslavia: The combined Axis troops (German, Italian and Croatian) begin another offensive against Josef Tito's partisan army. MTO - Egypt: Germans advance into Egypt as the British retreat continues. Sollum and Sidi Barrani are evacuated by the British 8th Army. MTO - Libya: US HALPRO B-24s night bomb the harbor at Bengasi. East Africa: Day 51 of 186 of the Battle of Madagascar. CBI - China: Day 1,814 of 2,987 of the 2nd Sino-Japanese War. Day 41 of 124 of Japan's Zhejiang-Jiangxi Campaign, launched to punish anyone suspected of aiding the Doolittle raiders in China. Roughly 250,000 Chinese will be killed. PTO - Alaska: Day 18 of 435 of the Battle of Kiska, Aleutian Islands. PTO - Malaya: Day 126 of 357 of the Battle of Timor Island. PTO - New Guinea: US 5th Air Force bombs shipping and the Vunakanau Airfield at Rabaul. ETO - Germany: RAF bombers attack Elberfeld in the Ruhr region of Germany. Russian Front - North: Day 655 of 872 of the Siege of Leningrad. Russian Front - North: Day 416 of 658 of the Siege of the Kholm Pocket. CBI - China: Day 2,179 of 2,987 of the 2nd Sino-Japanese War. PTO: Day 29 of 47 adrift in a raft for the survivors of B-24 GREEN HORNET that crashed 850 miles from Hawaii. PTO - Alaska: Day 383 of 435 of the Battle of Kiska, Aleutian Islands. PTO - New Guinea: Day 64 of 148 of the 2nd Battle of Lae-Salamaua. US 5th and 13th Air Forces provide air support. PTO - Solomon Islands: Day 5 of 67 of the Battle of New Georgia. US 13th Air Force provides air support. ETO - UK: Day 12 of 86 of the V-1 "Buzz Bomb" offensive on Britain. ETO - France: Day 19 of 49 of Operation OVERLORD, the Allied invasion of Normandy, France, known forever simply as D-Day. D-Day+18: Allied Air Forces provide air support. ETO - France: Day 19 of 62 of the Battle of Caen. ETO - France: Day 19 of 25 of the Battle of Cherbourg. The US continues their all-out ground attack. ETO - Germany: US 8th Air Force bombs oil industry targets in Germany. Russian Front - Finland: Day 4 of 50 of the Battle of Karelia. Soviet troops continue their offensive against the Finns in eastern Karelia between Lake Ladoga and Lake Onega in northern Russia. Russian Front - Finland: Day 2 of 5 of the Battle of Lake Ladoga. The Soviets continue their offensive to take all sides of Lake Ladoga. Russian Front - North: Day 144 of 191 of the Battle of the Narva Isthmus, Estonia. Both German and Soviet troops remain locked in their defensive positions. Russian Front - Center: Day 2 of 6 of the Battle of Orsha, Belarus. The Soviets encircle the Germans at Vitebsk. Hitler orders the encircled troops to fight their way out. Russian Front - Center: Day 2 of 6 of the Battle of Mogilev, Belarus, a Soviet diversion to pull enemy troops from defending other areas. Russian Front - Center: Day 1 of 6 of the Battle of Bobruysk, Belarus. Soviets trap a massive number of Germans defending Bobruysk. MTO - Romania: US 15th Air Force bombs targets in Romania. MTO - Italy: Day 9 of 34 of the Battle of Ancona (north of Rome). Allied Air Forces provide air support. CBI - Burma: Day 112 of 166 of the UK's Operation THURSDAY. Chinese troops, supported by heavy artillery, attack at Mogaung in support of the British Chindit operation. CBI - Burma: Day 107 of 147 of the Battle of Myitkyina. US 10th Air Force provides air support. CBI - Burma: Day 85 of 302 of the Chinese Salween Offensive. US 14th Air Force provides air support. CBI - China: Day 2,545 of 2,987 of the 2nd Sino-Japanese War. Day 69 of 259 of Japan's Operation ICHI-GO. Day 3 of 48 of the Battle of Hengyang. CBI - India: Day 109 of 118 of the Battle of Imphal-Kohima. The Japanese continue retreating back to Burma. PTO - Alaska: US 11th Air Force B-24s bomb the area north of the airfield at Kurabu Cape on Paramushiru Island. PTO - Japan: The USS TANG attacks a Japanese convoy southwest of Kagoshima reporting they sunk two of the ships. However, post-war Japanese records show that four ships of that convoy had been sunk. PTO - Mariana Islands: Day 10 of 25 of the Battle of Saipan. US 7th Air Force provides air support. PTO - New Guinea: Day 29 of 83 of the Battle of Biak. Although the battle is pretty much over, there are still 3,000 Japanese soldiers on the island willing to fight. PTO - New Guinea: Day 193 of 597 of the Battle of New Britain. US 13th Air Force provides air support. PTO - New Guinea: Day 64 of 481 of the Battle of Western New Guinea. 5th Air Force provides air support. PTO - New Guinea: Day 11 of 80 of the Battle of Lone Tree Hill. PTO - Solomon Islands: Day 237 of 295 of the Battle of the Bougainville Islands. US 13th Air Force provides air support. USSR: The Soviet Union celebrates Germany's defeat with a Great Victory Parade in Moscow's Red Square, during which 200 captured Nazi banners are tilted down in dishonor and thrown at the victorious Stalin's feet. 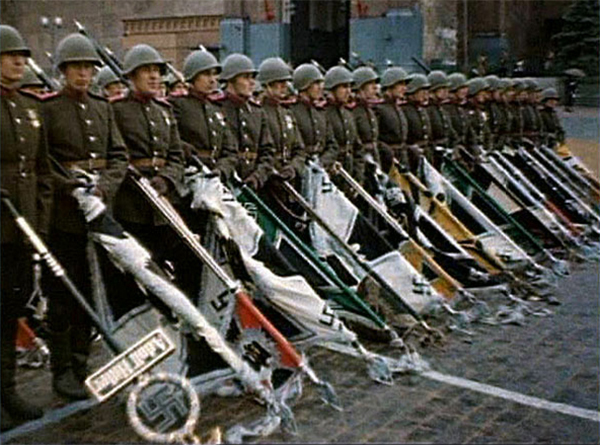 200 captured Nazi banners were tilted down in dishonor in the Red Square, Moscow, in the Great Victory Parade. What the western Allies call "World War II," the Soviet Union refers to as "The Great Patriotic War," during which 6.8 million Soviet soldiers were killed and 4.4 million died in captivity. The Soviet Union lost 26.6 million men and women in total, more than any other country in any single war in human history. CBI - China: Day 2,910 of 2,987 of the 2nd Sino-Japanese War. Day 85 of 91 of the Battle of Zhijiang. US 14th Air Force provides air support. Japanese troops continue pulling out of China. PTO - Alaska: US 11th Air Force B-24s bomb Kurabu Cape on Paramushiru Island. PTO - Borneo: Day 15 of 67 of the Battle of North Borneo. US 5th and 13th Air Forces provide air support. Australian troops capture Sarawak. PTO - New Guinea: Day 545 of 597 of the Battle of New Britain. US 10th Air Force provides air support. PTO - New Guinea: Day 429 of 481 of the Battle of Western New Guinea. US 10th Air Force provides air support. PTO - Philippines: Day 247 of 299 of the 2nd Battle of the Philippines, aka the Liberation of the Philippines or the Philippines Campaign. PTO - Philippines: Day 192 of 244 of the Battle of Luzon. 5th Air Force provides air support. PTO - Philippines: Day 107 of 159 of the Battle of Mindanao Island. 5th Air Force provides air support. PTO - Philippines: Day 99 of 135 of the Battle of the Visayas region. US 5th and 7th Air Forces provide air support. USA: A private pilot claims to witness a string of nine shiny unidentified flying objects darting across the skies over the state of Washington. 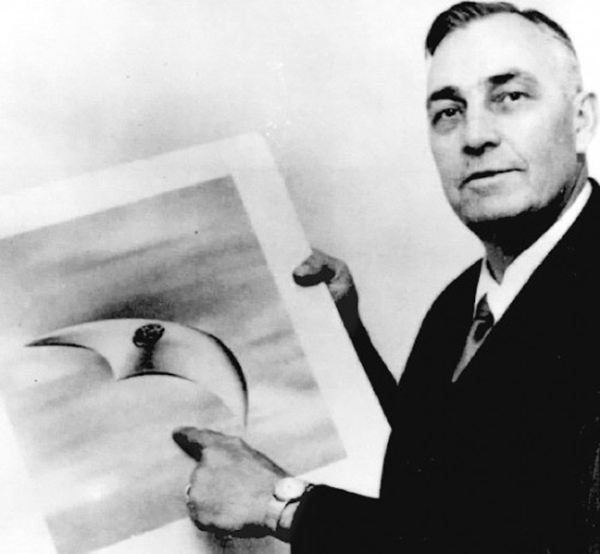 His description of each boomerang-shaped object's flight characteristics as "skipping like a saucer" leads the press to coin the term "flying saucer," which quickly becomes the popular descriptive term for a UFO. Private pilot Kenneth Arnold, flying on a business trip, witnessed nine objects darting past Mount Rainier at then unheard of supersonic speeds, which he determined to be at a minimum of 1,200 miles an hour. Although he clearly reported that these unidentified flying objects were "boomerang" shaped, the press focused on his phrase "skipping like a saucer" in his description of their flight characteristics. Thus the term "flying saucer" quickly spread to become the popular descriptive term for a UFO. This was the first post-war sighting in the United States that garnered nationwide news coverage and is credited with being the first of the modern era of UFO sightings, including numerous reported sightings over the next two to three weeks. The words "Flying Saucer" were used in the 08 Jul 47 headline of the Roswell Daily Record when it first reported the story of the 14 Jun 47 "Roswell" incident. Reports of Foo Fighters during the war had most often been described as being fast moving balls of light in a variety of colors. Many unexplained physical objects in the air during the previous century had been described as either being cigar shaped or rocket-like, a la Buck Rogers, but nothing similar to what Arnold claimed to have seen, which he naturally assumed to be new US military aircraft being developed. Not just their lack of tails, but the incredible speeds involved prompted him to file a report with Army Air Force intelligence. The publicity, which began with press interviews on the 25th and spread nationwide on the 27th, seriously disrupted Arnold's life in a variety of negative ways, casting him as a screwball, but it also generated a lot of fan mail and serious inquiries offering to help solve the mystery. On 07 Jul 47, two stories came out that first raised the possibility of an extraterrestrial origin behind his sighting. In the absence of any response from any government agency, Arnold began issuing opinions that if the Army has no explanation, they must be (inserting "and I know this sounds crazy") from another planet. Soon Kenneth Arnold himself began referring to unidentified flying objects as flying saucers. In the coming years, sci-fi magazines and Hollywood B-movies would firmly implant the stereotypical image of otherworldly flying saucers in the public perception. The importance of the "unidentified" part of the acronym UFO began to seriously erode. In a stark contradiction of terms, an unidentified flying object today is routinely "identified" as being a UFO. 24 Jun 47: Pilot reports 9 UFOs, press coins term "flying saucers"
Berlin: The Soviets begin the blockade of Berlin. 1947: Pilot reports 9 UFOs, press coins term "flying saucers"
The first full account of the epic struggle of what the USSR called "Great Patriotic War" from the Soviet perspective. While an immense twentieth century war was raging on Earth, there appeared to be someone, or something, from somewhere else, watching us. A truly perfect movie, the 1942 Casablanca still wows viewers today, and for good reason.